Leeuwarden is the Cultural Capital of Europe for 2018… Or should we say Sustainable Capital? On July 14th the Frisian people will hold the largest fossil-fuel-free parade ever. Three records will be broken: the largest parade of electric vehicles, of electric cars ánd the largest electric boatparade! Do you drive or sail electric? Then join us now, and set a world record! All fossil-fuel-free transport modes are welcome, on the water and on the road. Join us with your electric boats, cars, motorcycles, segways, Trefectas, and bikes. Vehicles powered by hydrogen, solar power or biogas are also welcome, as are sailing boats and canoes, regular bicycles and your grandfather’s choir on the back of horses! The more futuristic or quirky, the better! Young or old, with or without a driver’s licence, from soccer club to yachting society, you are welcome. The whole mienskip can join. 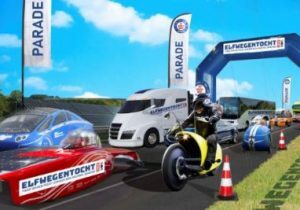 The Parade is on the final day of the two Cultural Capital weeks in which Friesland province will show the world that it can commute without one drop of petrol or diesel! DON’T MISS IT AND REGISTER HERE!